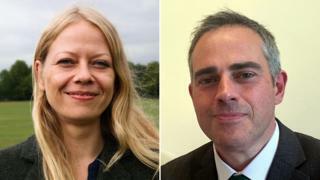 Sian Berry and Jonathan Bartley have been elected joint leaders of the Green Party of England and Wales. Mr Bartley had shared the leadership role with MP Caroline Lucas, but she decided not to stand again. London Assembly member Ms Berry will now serve a two-year term as co-leader of the party alongside Mr Bartley. The pair saw off challenges from Shahrar Ali, a former deputy leader, and former parliamentary candidate Leslie Rowe. Ms Berry and Mr Bartley won 6,239 of a total 8,379 votes cast. Contenders Shahrar Ali and Leslie Rowe received 1,466 and 495 votes respectively. Deputy leader Amelia Womack was re-elected with 3,981 of 7,369 total votes cast. The co-leaders said they wanted the party to be "the opposite of vapid, old school centrist politics" by responding to the "big challenges of our time - from Brexit to climate breakdown and the housing crisis, to automation and the broken world of work". They also promised "fiercer Green resistance" against fracking and the HS2 rail project. "When faced with the environmental destruction of fracking or the spiralling costs of HS2, or the inhumanity of indefinite detention and forced removals of refugees and migrants, we are not afraid to join protestors putting their bodies on the line for what is right," Mr Bartley said. Ms Lucas, the party's only MP and its figurehead for many years, was arrested during a fracking demonstration in 2013. In a noisy, polarised political debate, the central challenge for the Green Party is being noticed. It's certainly novel in politics for leaders to have a job share - Jonathan Bartley and Sian Berry see this as a badge of their modernity; such arrangements being commonplace in many other careers. The potential downside for them is the lack of a single figurehead; one face and voice that personifies the party on the public stage. Mr Bartley has led the opposition on Lambeth council since being elected a Streatham councillor in May this year. Ms Berry was elected Green London Assembly member in 2016, when she also came third in the London mayoral race. She has been a Camden councillor since 2014. Ms Womack was re-elected deputy leader of the party for a third term and will continue work on women's rights, including the campaign to make misogyny a hate crime, as well as work on sustainable communities and the environment. The party failed to make its hoped-for breakthrough in the 2017 general election, as its vote was squeezed by Labour. But it made headway in May's council elections, adding eight seats. The new co-leaders said they wanted to see Green representation on every council in England as part of their ambition of becoming the "third political party" in Britain.